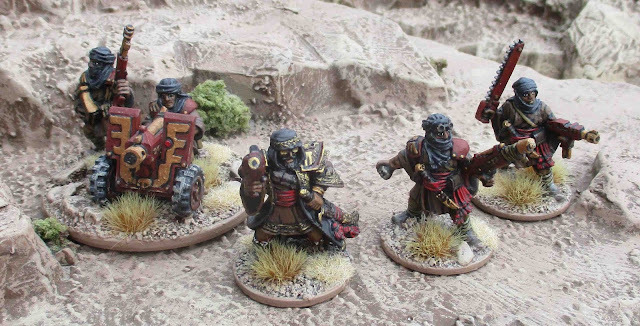 Here is my collection of Tallarn Desert Raiders for Warhammer 40,000 – or at least the ones I have painted so far! The forces below represent elements of 5th Company, 382nd Tallarn (Desert Raider) Regiment and various attachments. These represent elements attached from within the regiment either at the company level (that don't fit into the regular infantry platoons) or regimental level. Veteran Squad – commanded by Sergeant Major Murad – I’m not sure where the Veteran Squad will fit in to the Org Charts, but I have one… I painted them up mostly to use as a Kill Team in Shadow War: Armageddon. Power Level 5 - 100 points. These represent elements attached to the company for other regiments. 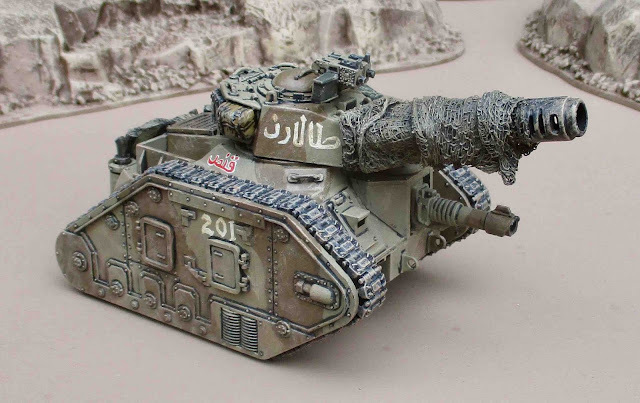 All the attached elements her are from other Tallarn Regiments that I imagine make up a larger Tallarn Battlegroup. 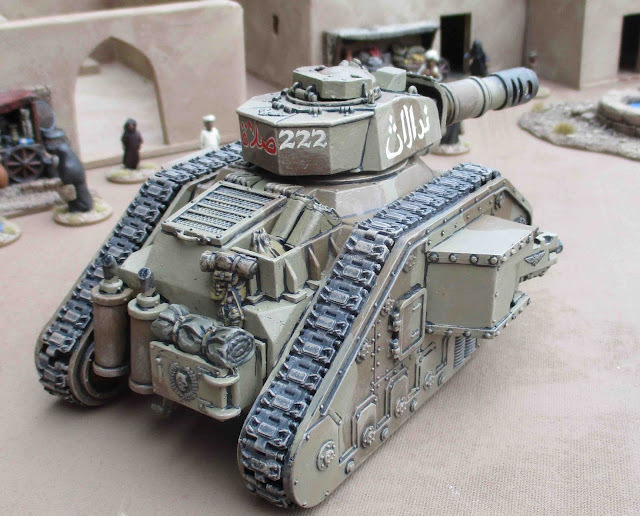 They are mostly Armoured elements from the 451st Tallarn Tank Regiment and the 17th Tallarn Super Heavy Tank Regiment. 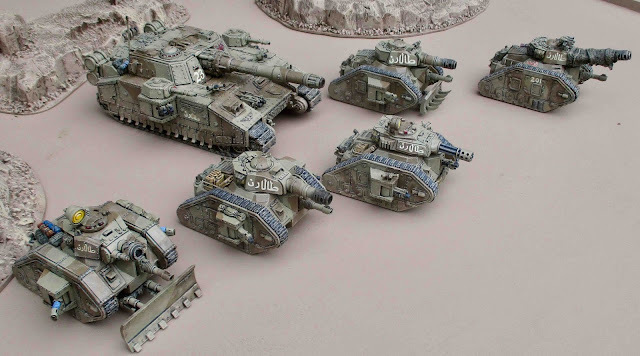 Elements of #2 (Arkan) Troop, 2 Squadron 451st Tallarn Tank Regiment attached in direct support. 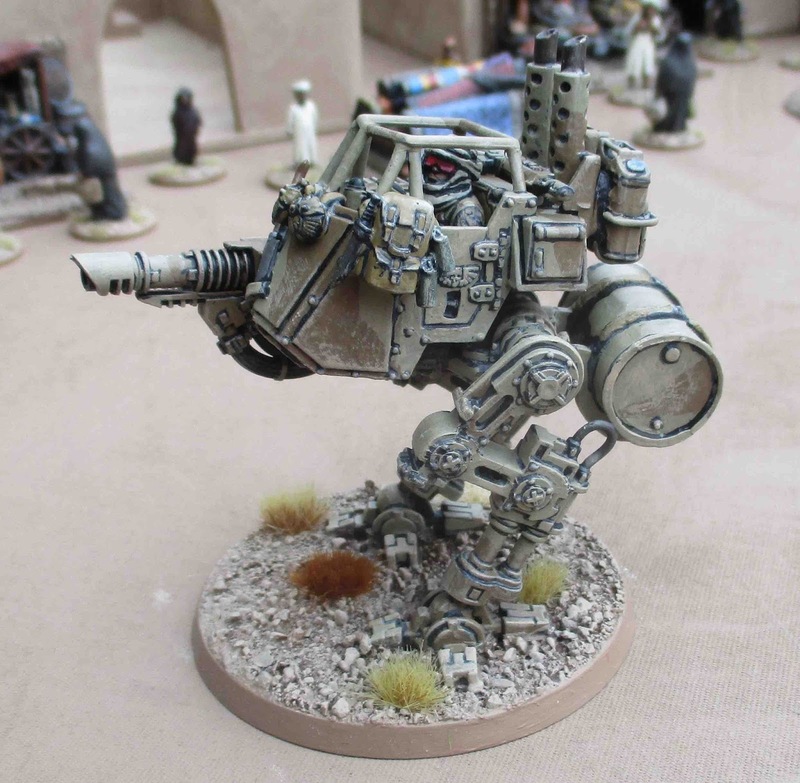 Battle Cannon, Lascannon, 2x Heavy Bolters, Dozer Blade. 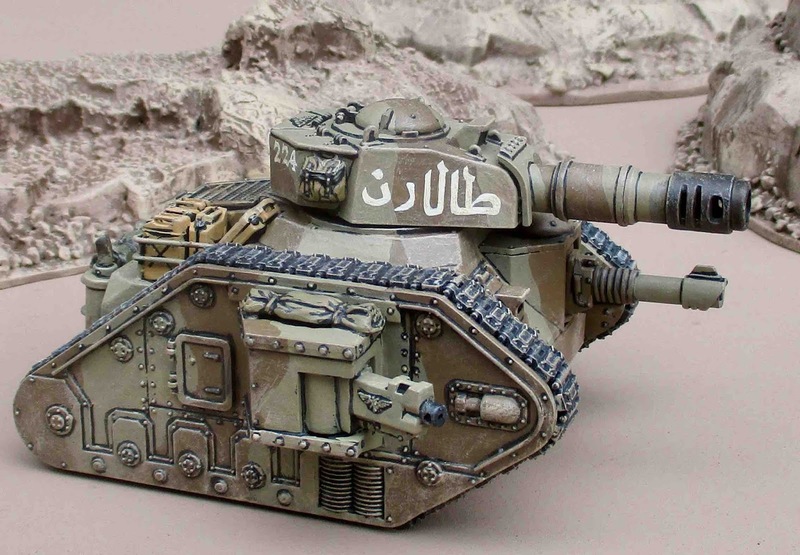 Captain Naji Raji is the commander of 2 Squadron 451st Tallarn Tank Regiment and sometimes accompanies #2 (Arkan) Troop into battle. This tank is from the 451st Tallarn Tank Regiment 8th (Assault Engineer/Support) Squadron. 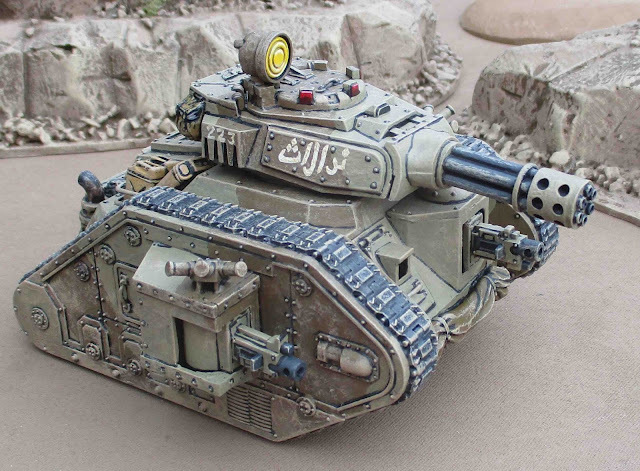 The attached Shadowsword is from 2nd (Raid) Squadron, 17th Tallarn Super Heavy Tank Regiment. 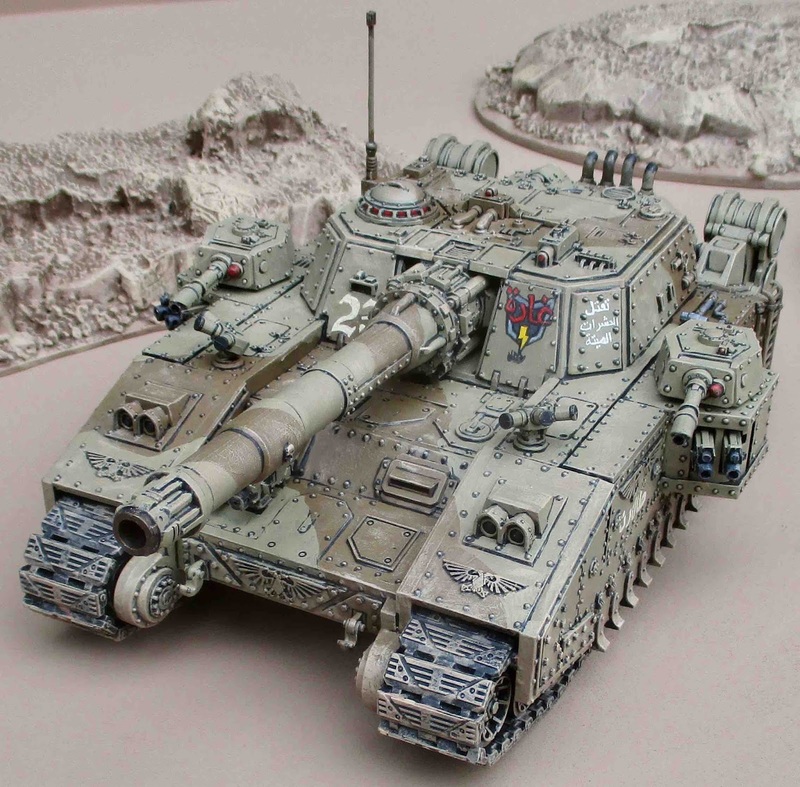 More on the Shadowsword here: Shadowsword! So far, that’s about Power Level 142 or 2666 points. 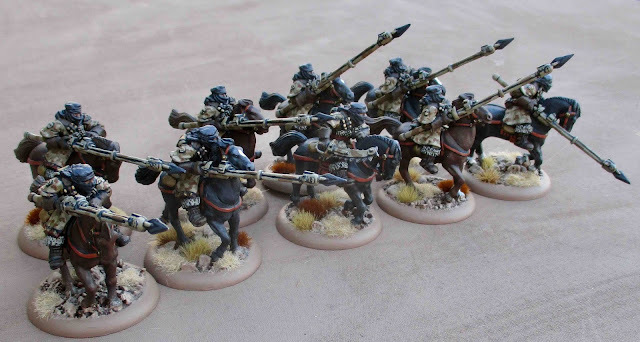 I can now field a "Brigade" Detachment (+12 Command Points - according to the latest FAQ - for a total of 15!) I'd currently need to field the Roughriders as two squads of five - though I still wouldn't be able to field ALL of the Elite options. The Shadowsword would be fielded as a separate Super Heavy Auxiliary Detachment. Pretty soon I'd be able to field most of the armour as a completely separate "Spearhead" detachment. Really...? Do I NEED to add anything to this force!? Maybe another Super Heavy (or two!? 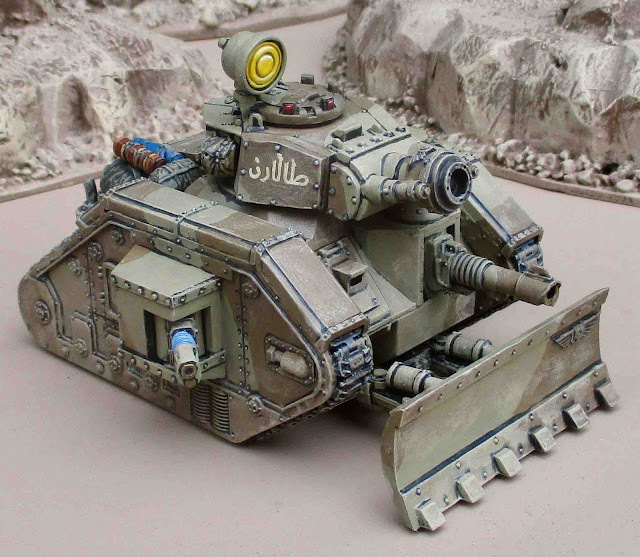 a Baneblade and a Storm Lord) – once EVERYTHING ELSE is DONE! 383.018.M42 - #2 ("Arkan") Troop, 2 Squadron 451st Tallarn Tank Regiment saw action against a Necron force on Brind's World: The Battle for Brind's World Rages On! 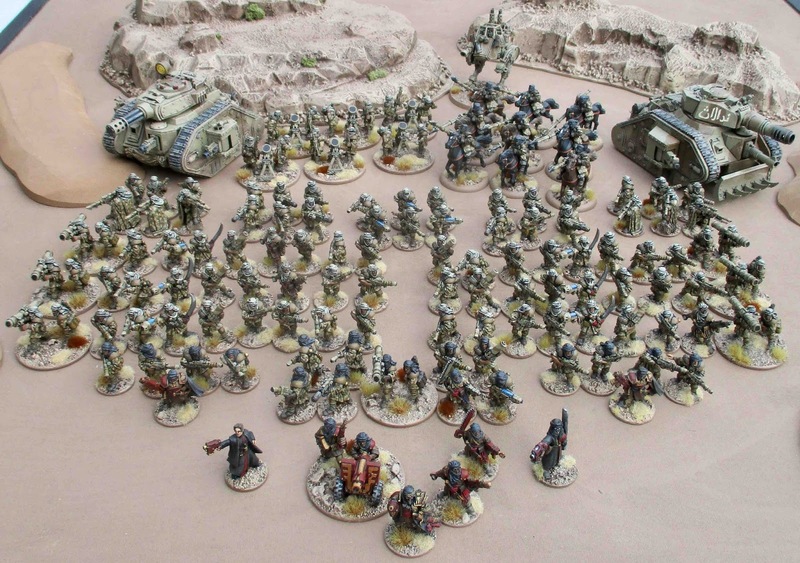 4.553.018.M42 - First Platoon was attached to a force of Adepta Sororitas at the Battle of Bassal Buttar. 4.037.019.M42 - Friendly Fire Incident on Xoxigar Secondus. 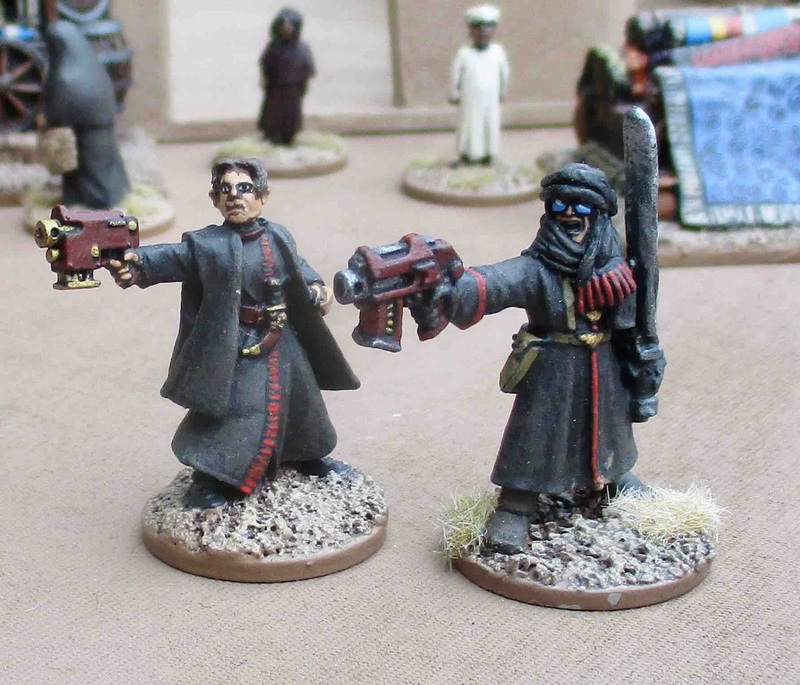 Shadow War: The Raid - Kassab's Team saw action against the enigmatic Harlequins! Shadow War: Armageddon Again - Kassab's Team faced another Xenos threat: the T'au! You should update the squad write-up that contains Aziz the unphotogenic.